The Game of Thrones score, composed by musical genius Ramin Djawadi, has iconic songs like the show's pounding main theme and the haunting season six finale score, "Light of the Seven." Now the HBO series is getting a whole new set of songs to celebrate the imminent arrival of season eight from artists like SZA, Ellie Goulding, Maren Morris, The Weeknd, and more. Quite the lineup, eh? 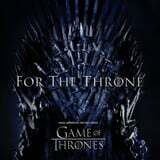 For The Throne is available for preorder now since it won't hit shelves until April 26. In the meantime, enjoy the album trailer, ahead.